Nintendo has been hinting that the next Pikmin game would be on the Wii U, and confirmed Pikmin 3 for that console today at its E3 conference. The upcoming game can be played using the Wiimote and Nunchuck with assistance from the GamePad (the tablet controller), or with only the GamePad. When used in combination with the Wiimote/Nunchuck, the GamePad will show the overall map of the level and allow the player to quickly assign groups of pikmin to far-off locations. 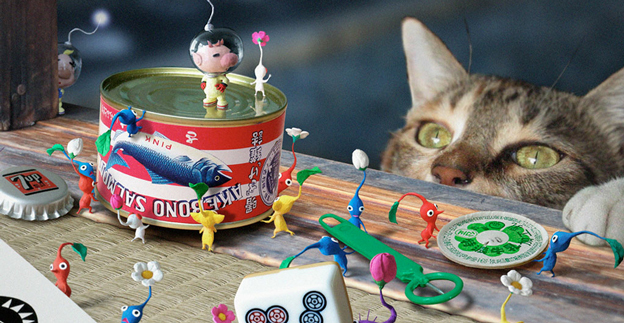 Although the basic Pikmin gameplay remains intact, there are several changes in this edition. Rock pikmin have been added to the roster and can be used to break hard objects. All the pikmin can now pick up object pieces and use them to build helpful items like bridges. Finally and most importantly, there will now be four leaders available to herd the pikmin around, meaning that four different groups of pikmin can be active on the maps at once. Nintendo describes these changes as adding more strategic depth to the game.